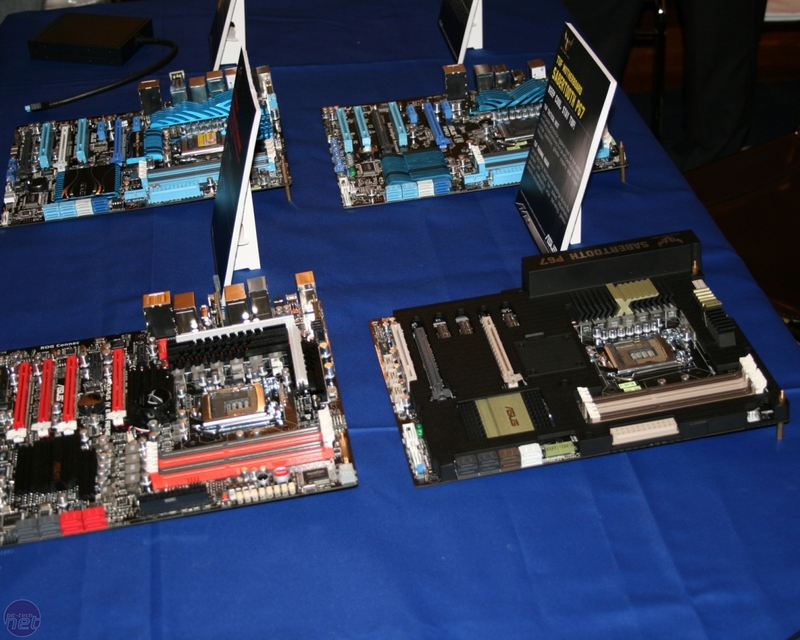 Asus treated us to a preview of a range of new motherboards the other day, from boards with current-generation sockets to some first looks at the motherboards of the future. 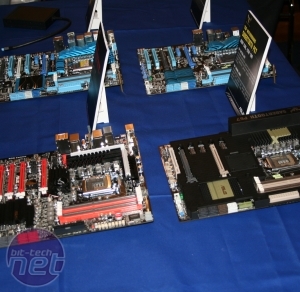 The very near future, if you’ve been following the buzz around Intel’s Sandy Bridge processor, due in January 2011. 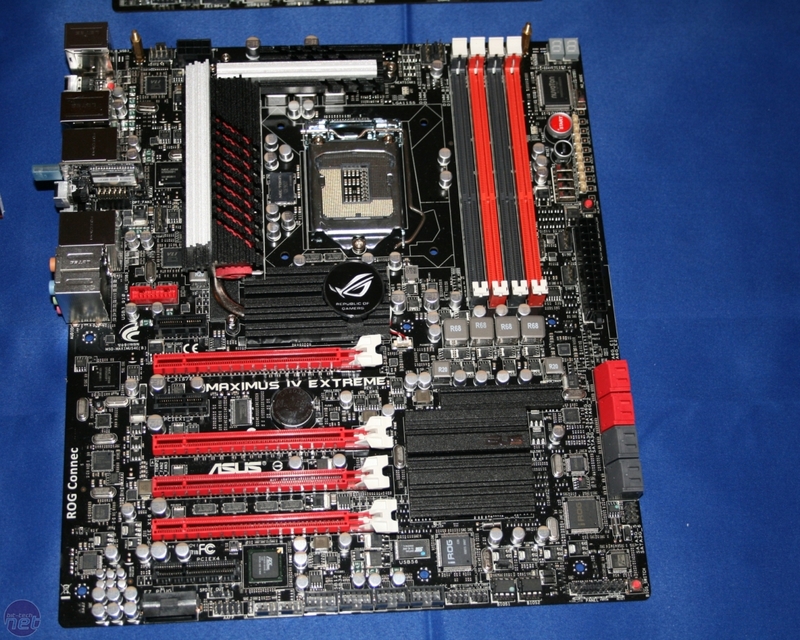 If you have no idea why Intel has a Sandy Bridge, the previous link will get you up to speed. We’ll start with the imminent Republic of Gamers board before moving to the rugged Sabertooth P67 and more mainstream LGA1155 motherboards. Residents of the Republic of Gamers will know that if a board has the suffix ‘Extreme’ it’s intended to be covered in wadding and chilled to within degrees of absolute zero. 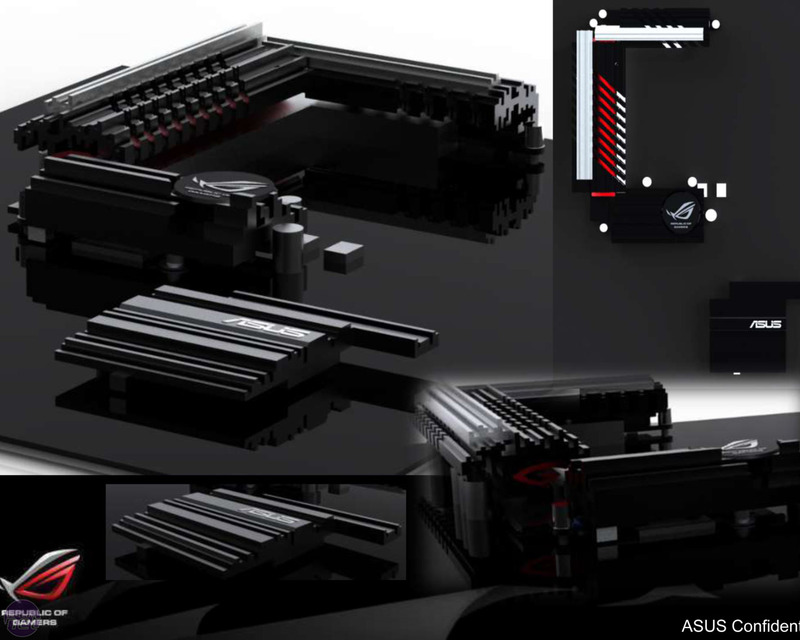 They’ll also know that boards named in homage to Russel Crowe’s gladiator are based on the mid-range Intel chipset – the Maximus IV Extreme (M4E) therefore pitches itself as one of the fastest, most overclockable of the forthcoming LGA1155 motherboards. The M4E features a new cooling design, based on the ‘structure, layer and curve’ designs of the latest Star Trek film. 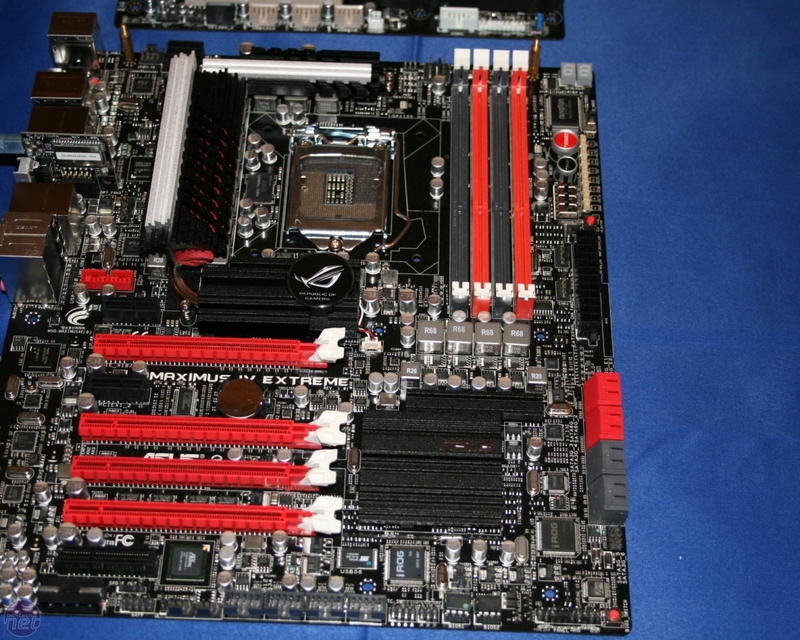 As an overclocking-friendly motherboard, there’s cooling for the VRMs and Southbridge. 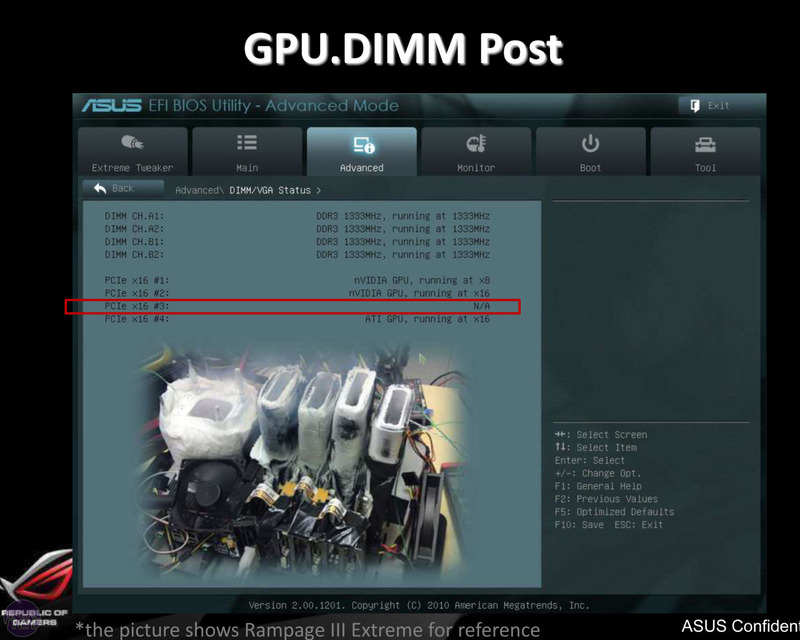 Asus has also updated the features on offer, adding the GPU.DIMM post BIOS option to identify a GPU or graphics card that’s not working. This should mean that faults are found quicker in overclocking competitions, allowing the competitor to concentrate on getting the highest score possible. 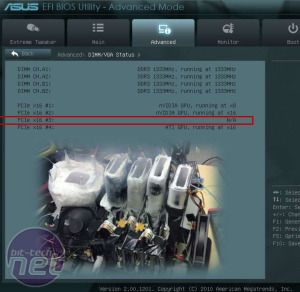 Speaking of the BIOS, the M4E features an EFI (Extensible Firmware Interface) BIOS, meaning that it looks pretty, has new options an can be navigated with a mouse. 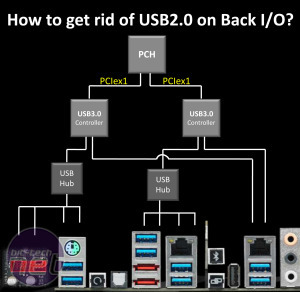 You can even save screenshots of this BIOS to a USB flash drive. Once you’re into Windows, there’s still a wealth of overclocking tools to use. We’ve seen ROG Connect before (which allows you to overclock a system via a laptop) but Asus has added the ability to overclock the M4E from a smartphone via ROG iDirect. 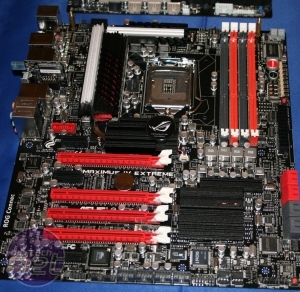 The Maximus IV Extreme uses an EFI BIOS, and offers many remote overclocking options. 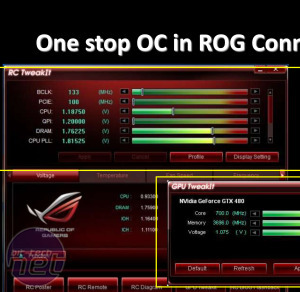 Asus believes that the various external overclocking controls (ROG Connect and so on) offer a benefit for competitive overclockers, as the overclock requires less than 1 per cent of CPU overhead. This means that there’s no danger of CPU performance being taken from the benchmark that’s running, or that the act of overclocking (rather than the overclock itself) pushes a system over the BSoD cliff. We’ve always wondered if anyone actually uses ROG Connect, as surely turning off extraneous extras helps extreme overclocks – if you have, please post your comments in the discussion thread. 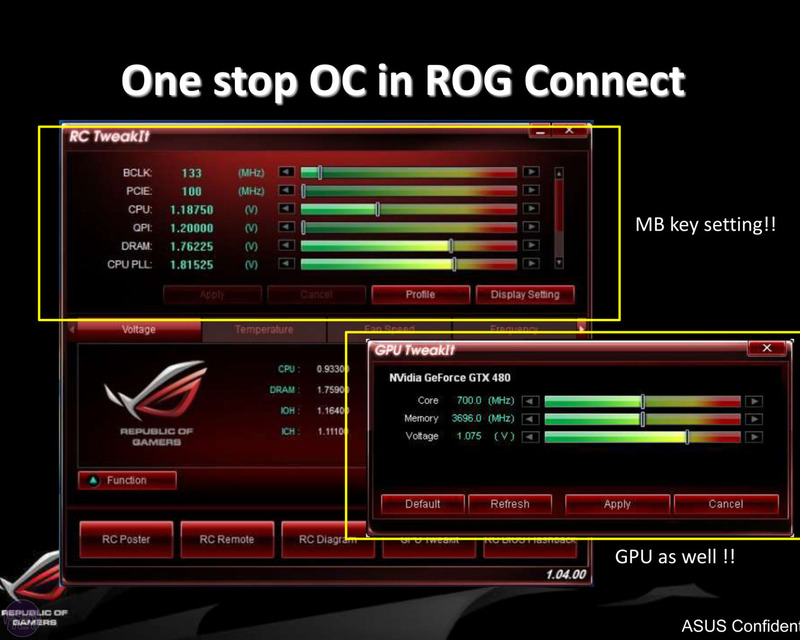 Asus showed us its new GPU TweakIt, which overclocks graphics cards. This also works via ROG Connect, following the same design and layout queues, and is vastly more easy to use than Smart Doctor and its Voltage Tweak section. As far as the hardware on the M4E goes, there are metal-packaged MOSFETs in the VRMs which are said to have four times the conductivity of the conventional epoxy-molded units and 48 per cent faster heat dissipation. Asus also uses alloy chokes, rated at up to 40A, to improve efficiency, especially at low and high amperage levels. 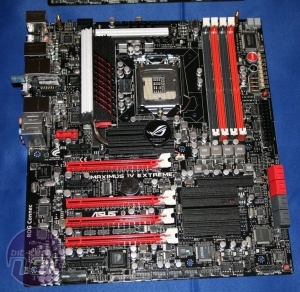 The M4E has practically ditched USB 2 entirely, leaving only one port for ROG Connect. 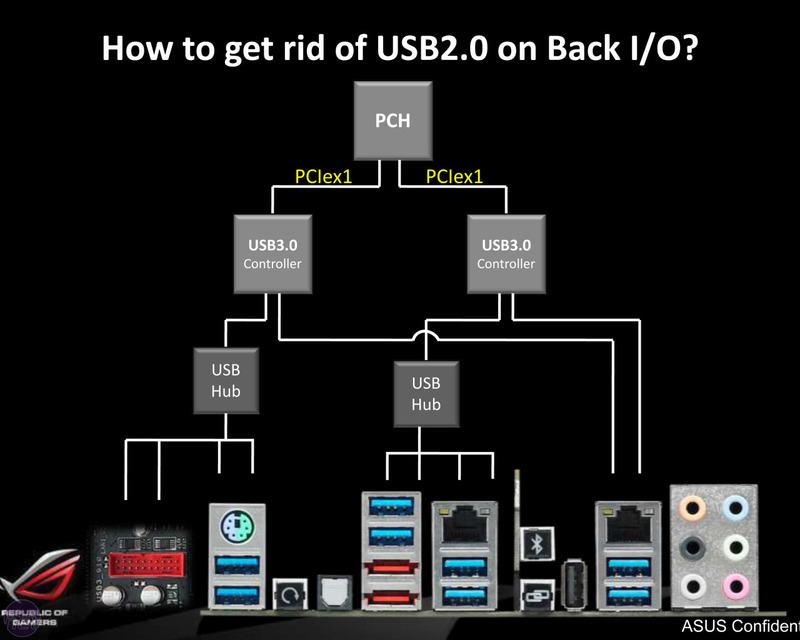 Asus has used two USB 3 controller chips and two USB 3 hub chips to give the rear I/O panel eight ports – two ports are fed directly from the USB 3 chips, though Asus claims these are only 1 per cent faster than the six ports fed by the USB hub chips.